When I share with people my assessments of where the Earthlings are stumbling rather blindly, my listeners often say: "Oh, you are such a pessimist! What would you do differently?" My short answer is: "Stop, face reality, and think. Facing reality is not pessimism. Do not try to be a better, more obedient sheep, whose sheephood is certified by a Harvard et al. at a huge expense. Squealer teaching Molly a new slogan she will recite with unbending conviction and lead other sheep in repeating it. Think of Fox News, MSNBC, Facebook, Rush Limbaugh, most newspapers, and almost all glossy magazines on sale in the U.S. I can think of only four magazines that appear not to be run by the U.S. pigdom. For those who have read and understood "Animal Farm" by George Orwell, let me remind you the fate of Boxer, a powerful horse, who dedicated his life to hard labor for the good of others, and was greatly admired by all animals. 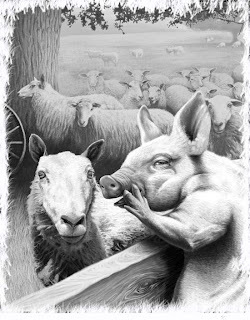 With his strong muscles and persistence, Boxer created the prosperous Animal Farm, but when his lungs gave out he was immediately sold by the ruling-class pigs to Alfred Simmons, Horse Slaughterer and Glue Boiler. The semi-literate animals were told that Boxer was being transferred to a hospital and later to a retirement house, where he would be able to rest and enjoy fruits of his hard labor. Only the clever and well-read donkey, Benjamin, was not deceived and tried to warn the naive animals, but he was too slow in convincing his fellow four leggers, and Boxer disappeared from the farm forever. I often find myself in Benjamin's position. Whatever I attempt to do is too little too late, and the current generation of pigs - Squealers more precisely - knows even better how to deceive, divide, and control a multitude of the honest, well-meaning and hard-working Boxers in our society; soldiers, for example. My other advice is: Educate yourself. Here "educate" does not mean "get certified," or "buy mediocre, useless education from the most expensive, for-profit outfit." When I say "educate," I mean give yourself a way of discerning between lies and misinformation you are fed each second of every day and truth as best as you can establish it by whatever means. Two examples come to mind. The first example was pointed out by my well educated son: Will Americans Make Tradeoffs They Don't Understand? This example touches upon the all-important concepts of energy and fuels. Without the high energy density, fungible fuels flowing at high rates through our complex civilization, our society will cease to exist within 20-30 years from today. A Public Agenda survey in 2009 found nearly 4 in 10 Americans (39 percent) couldn’t name a fossil fuel. Nearly half couldn’t name a renewable energy source. More than half of the public (56 percent) says incorrectly that nuclear energy contributes to global warming. About one-third of the public (31 percent) thinks solar energy contributes to global warming. While the survey is a few years old, I am skeptical that public knowledge has improved all that much. I know first hand, because I am a Benjamin who teaches these concepts to college-level engineers. Since my blog is dedicated to the issues of energy, society and ecology, I'll only state that this particular ignorance is deadly for a society that makes no efforts to diversify itself away from personal automobile and to densify its cities. The second example has to do with Facebook's IPO. 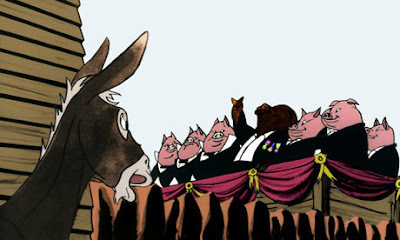 Almost all media reactions (please have a second look at Molly) focused on the failure to price the stock sufficiently low, so that the pigs at the trough could make a one-day killing by flipping the fast appreciating stock for cash. This is considered to be in bad taste in the casino that used to be known as U.S. economy. When a new company wins by being well-financed with its IPO, that's bad. But when pigs make oodles of cash they did not earn, that's good. Now please do not get me wrong. I think that Facebook epitomizes what is wrong with us. The largest IPO in recent history is for a company whose business plan is to inject pigdom into the lives of a bunch of narcissists (from Greek narcissus, meaning "sleep" or "numbness") and voyeurs, while pretending to be a socially responsible agent. The unquestionable social benefits of Facebook appear to be incidental and orthogonal to its money-making mission. I am still waiting for a multitude of IPOs of manufacturing companies, oil companies, mineral mining companies, mass transit companies, computer hardware companies, organic farming companies, healthy food companies, solar water heater companies, or cheap drug companies; anything that would make me believe that there is a way to cure my beloved but confused country from the self-inflicted wounds. These companies do not have to be big and should serve their local communities. And if you believe that Facebook catalyzed change in the world, this may be so, but please remember that the overthrow of communism in Poland and Eastern Europe, the most important event in the last six decades, succeeded without Facebook or cell phones. Educated, determined, and ethical people did it. Those people got really fed up with their pigs. P.S. As a timely addition to my blog, please read this New York Times article on local TV coverage. Local news(?) is still the number one source of information(?) for Americans. Thus, it is instructive to understand that now it does not matter which station you are watching. The agreed-upon coverage will be the same in most markets. I do not watch anything on TV, but PBS and - occasionally - Comedy Central between 10 and 11 p.m. Jon Stewart and Stephen Colbert bring the only solid, fact-checked, and informative news U.S. citizens can count on outside of NPR and PBS. How funny and sad at the same time. The unquestionable social benefits of Facebook? Maybe of online social networking in general, but Facebook has never really existed to improve anyone's social life. It's origins suggest that it has always incorporated an element of schadenfreude, at the very least, and of course it is now openly a data collection site for retail companies, packaged as a social networking site, but designed to keep people addicted to the attention of their "friends" and thus constantly feeding more and more data into the system. All good with one glaring exception: nuclear power does contribute to global heating. That is, it produces a lot of CO2 and other GHGs, when the entire life of the technology is considered. A full accounting would be extremely difficult. Van Leeuwen and Smith made a great contribution, but much is yet to be done. For instance, what is the global heating effect of the loss of land and infrastructure of the nuclear disasters at Chernobyl and Fukushima? Of the enormous quantity of fossil fuels that were burned to construct the Yucca Mountain waste repository which will never be used, therefore a total waste? There is no room here to write even the first paragraph on a subject that would fill an enormous library. The money and resources we spend on the nuclear power industry only dig the hole we are in ever deeper, and prevent the full implementation of sustainable energy technology. I am sorry to learn that Dr. Patzek apparently supports this insane program. My quote applies - I think - to a properly working nuclear power plant. If one draws a system boundary around that plant, it will not emit the roughly 2 million tons of CO2 that are emitted each year by a comparable coal-fired power plant. Your analysis is much deeper and extends the system boundary to regions far away from the power plants. Once we start going down this path, no human activity escapes to one degree or another. Industrial agriculture serves as a good example. As a dominant species, Homo Sapiens now causes a rapid deterioration of its direct environment: The Planet Earth.